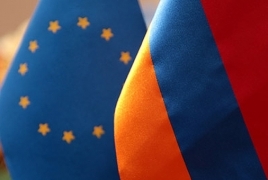 PanARMENIAN.Net - The European Union has a clear stance on the Karabakh conflict settlement, the head of the EU Delegation to Armenia told reporters Thursday, November 19, Panorama.am reports. According to Ambassador Piotr Switalski, the EU supports the OSCE Minsk Group and its Co-chairs. “We condemn the use of violence and call on the sides to reach a peaceful settlement through dialogue. The EU hopes that an early resolution to the conflict will open new economic opportunities for both Armenia and Azerbaijan,” Switalksi said. The EU is ready to contribute to the confidence building process, the ambassador said.